All credit card purchases either called in or done online will have to clear before we will ship your product (Usually 1 to 3 Business Day's to Clear). PayPal payments made as an instant transfer with either PayPal funds or a credit card linked though your PayPal account will ship the same or Next Business day. E-checks thru PayPal / Braintree or other posted provider can take up to 10 Business days to clear and we do not control this time frame. ANY PAYMENT FLAGGED FOR FRAUD BY OUR PAYMENT PROVIDERS WILL BE CANCELED AND REPORTED TO THE PROPER AUTHORITIES. Amazon Pay Payments Will Have To Deposit Before We Ship (7 to 10 Business Days To Deposit) Then We Ship. WE WILL NOT REFUND OR PAY SHIPPING CHARGES ON RETURNS. WE WILL NOT BE HELD LIABLE FOR LABOR, RENTAL CAR OR INJURY. 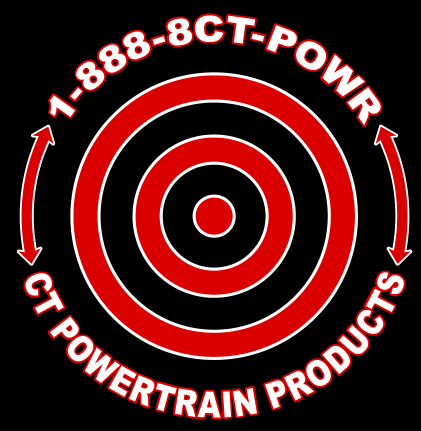 ALL CONTENT, NAMES, IMAGES, PICTURES ARE PROPERTY OF CT POWERTRAIN PRODUCTS AND CANNOT BE USED WITHOUT OUR CONSENT IN WRITING. Our prices do not include taxes and tariffs. Customers outside of the United States may be required to pay these fees to the courier, as applicable, upon delivery. For example, Canadian customers will be assessed the 7% GST (Goods and Services Tax) or the appropriate HST (Harmonized Sales Tax) or PST (Provincial Sales Tax) when the order arrives. Please consult your local customs office or tax authority for information specific to your situation. For your protection we insure all our shipments. An additional insurance charge may assessed based on the actual value of the shipment. Duties and taxes are the responsibility of the person receiving the shipment and will be due at the time of delivery. Please take this into consideration when ordering, as the amount will vary by country and CT POWERTRAIN PRODUCTS does not have access to these amounts. * Our prices do not include taxes, tariffs or additional fees assessed by your customs broker. We cannot mark an item as "gift" or "return" to avoid customs fees. This is illegal in the USA and a Federal offense and we do not break this Policy/Law, EVER. If you are outside the U.S. and you would like a shipping quote, E-mail your physical address and we will provide a quote within 24 hours (M-F).